Described as Australia’s first social franchise, the aptly named shoe shine enterprise, Buffed, has launched in Brisbane . The social franchise was launched by Wise Foundation and founding partners BOQ, University of Queensland Business School and The Body Shop. Buffed provides opportunities to individuals who are currently unemployed or underemployed to secure their futures through small business ownership with each Buffed site owned and operated by individuals under a franchise model. This shoe shine stand franchise network will operate initially in Brisbane CBD sites with future plans for expansion in to Melbourne and Sydney in early 2012 followed by a national rollout. The concept is the initiative of the Wise Foundation, founders of numerous other successful social enterprise initiatives including Bizness Babes, Bleeding Heart and the successful Big Issue street newspaper. The Wise Foundation says it is the financial and ongoing support that differentiates Buffed from other franchises, allowing disadvantaged individuals to purchase and operate their own business with the provision of no interest loans to assist in funding the acquisition fee plus free ongoing extensive training, development and support throughout their life as a Buffed franchisee. Graeme Wise, Chairman of the Wise Foundation, said that Buffed not only helps the franchisees’ immediate future but will set them on their way to achieve their long term aspirations. “Buffed is focused on the development of innovative social infrastructure that will provide a platform of opportunity to people who rarely, if ever, are presented with these prospects. For some individuals it may be the start of a career business while for others it is simply a solid albeit life changing stepping stone to achieve even greater things,” said Wise. “There are so many people who are very passionate about improving the lives of themselves and their families. They are willing to work hard to achieve that but might not have the knowledge, skills, networks or capital to take those necessary steps to start their own initiatives. “While growing their own Buffed franchise, they will develop not only the skills to deliver a professional and prompt shoe shine, but also the experience and confidence that will greatly assist them in life both in the short and long term. BOQ Managing Director and CEO Stuart Grimshaw said that Buffed has created a platform for business, community and government to work together to actively assist in the creation of opportunities that will enable individuals to secure their future in ways not previously possible. The launch was attended by many of Brisbane’s leaders in the corporate, Not for Profit, academic and government sectors, keen to understand how social innovation and common market structures are being positioned to address systemic social issues such as unemployment. 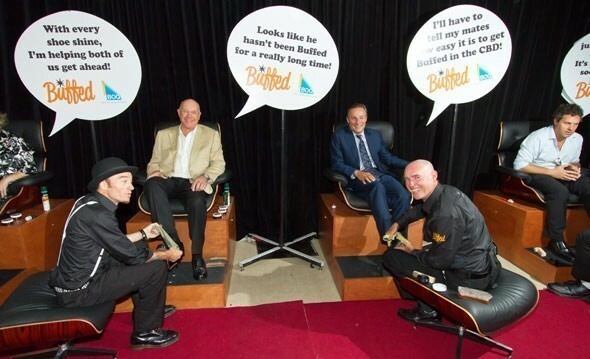 The inaugural Buffed shoe shine franchises will be opening across Brisbane’s CBD within the next few weeks in premium office tower foyers, retail arcades and transport nodes.